← #mayguerney – ignorance, or simply contempt for pedestrians? 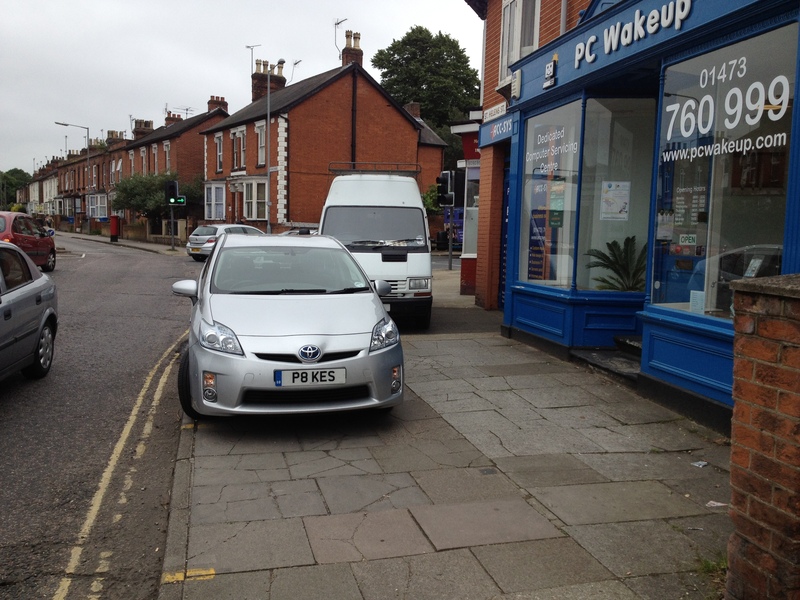 The cracks on the flagstones outside the PC shop show that footway parking is endemic here. 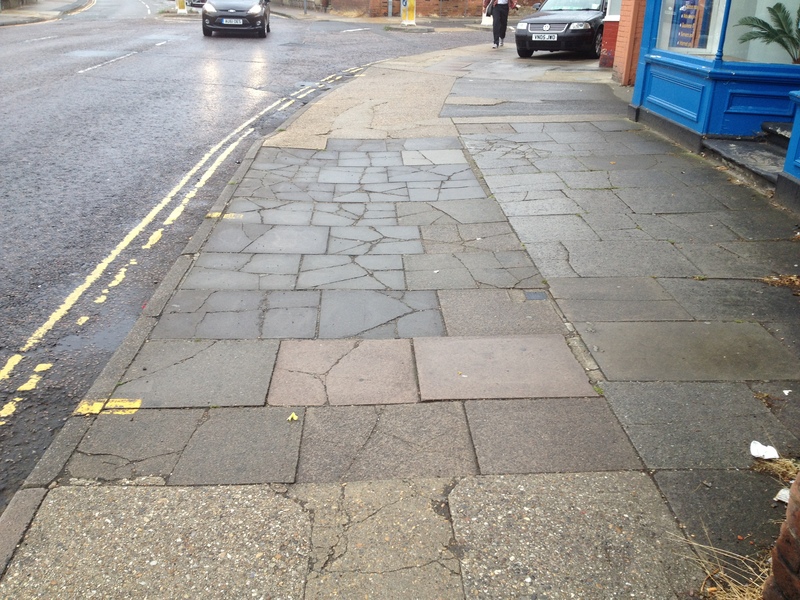 Pedestrians don’t crack flagstones. 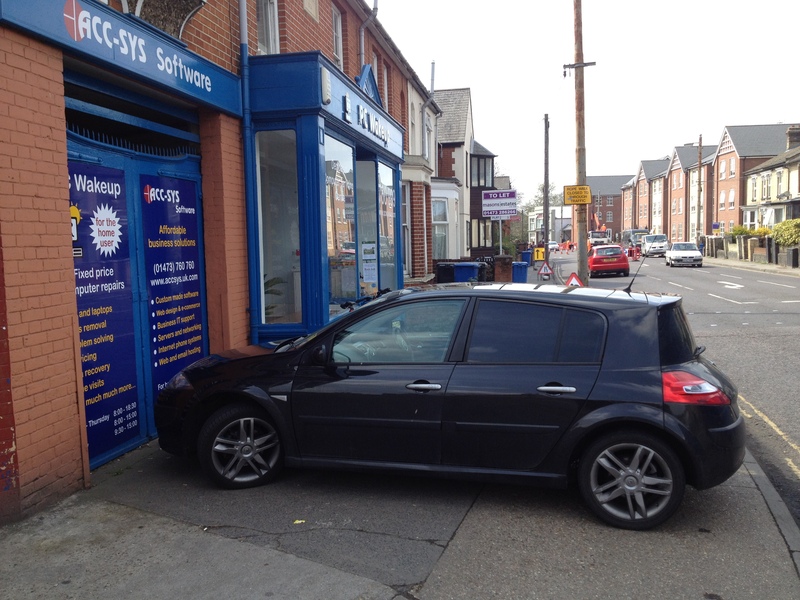 Pavement parking isn’t just illegal and anti-social, it’s costly to repair. Good point. I had noticed that as well, and took a photo of the area outside the shop when it was clear of cars yesterday. I will update the post. Congratulations of getting the BBC to do a piece on ‘car tax’. I wonder if we could get them to do a serious piece on this subject at some point. I’ll email Roger Harrabin, who did the report. 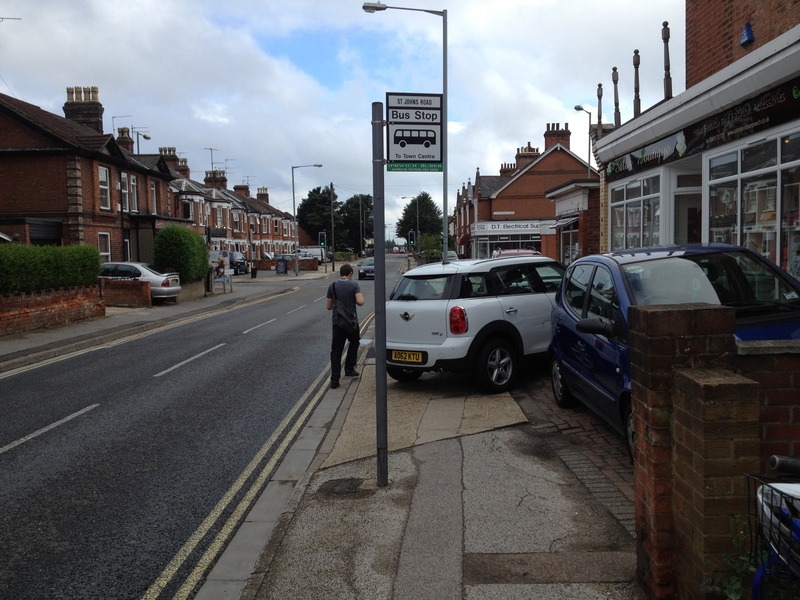 Footway parking is a crime that society deems not to be one anymore. I couldn’t even get it mentioned in the Get Britain Cycling report despite providing tons of information to MPs and the report author. 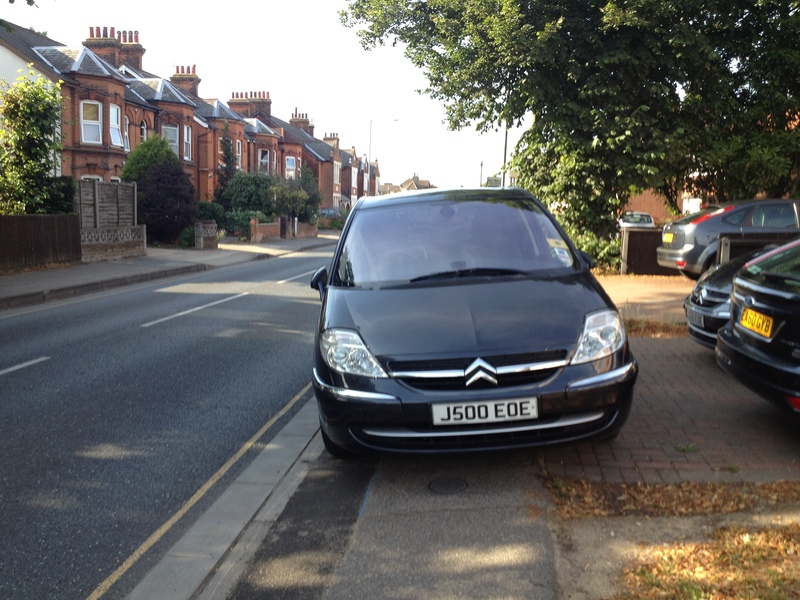 I agree that parking on pavement is illegal but there no common sense in enforcement officer. Will not do my job don’t care attitude . They have the power put won’t use it. I am disabled they say they can get by it not obstruction go another way in my case over half mile. Now that a Hate crime in my book, can you get legal help No. Andrea. Calum, the article linked to is from 2012. Is there any update to how this is progressing? This is the problem, neither the police (who are there to enforce the law) nor politicians (national or local) are willing to stand against the motoring lobby. While cycling on the pavement is illegal. The legislation that implemented fixed penalty fines for it was accompanied by guidance that stated that the law should be enforced only when cyclists are considered to be cycling inconsiderately/dangerously. I am a walker who feels that cyclists try to intimidate me – and, more importantly, the old, the infirm, and pregnant women. Who’s on my (and their) side? As things stand, cyclists are in a protected position, without obligation to be insured, yet free to use the roads, and knowing that a motorist is presumed guilty in terms of civil liability. Police simply do not enforce their exclusion from pedestrian areas, any more than they keep cars from blocking pavements and driveways. I look forward to a time when pavement etc sharing has full legal status – and the cyclist carries presumption of full civil liability if in collision with a pedestrian, and thus must be insured against that liability. One law for all, and all free to take responsibility – that’s democracy. 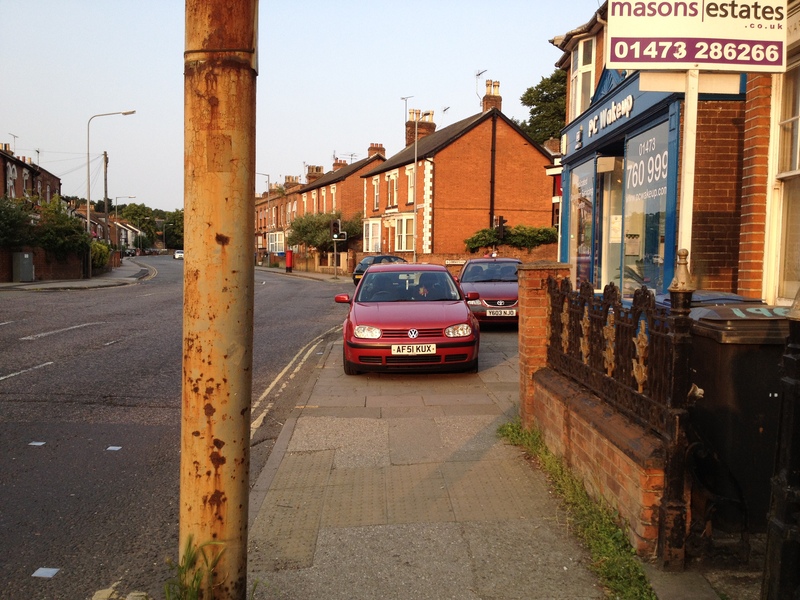 Hi Im not in Ipswich but have just found this blog whilst looking for information on pavement parking. Have been visiting family in the Medway Towns in Kent and have a disabled sister who uses crutches. Last night she had difficulty using the pavements on her way home because of large vans blocking the path. She says that this happens all the time and you have to walk in the road at times. I just sent a picture of a van blocking the path to the local council. Shall wait and see if they do anything. Im a pedestrian myself and get fed up with the total disregard that officials have for our safety. Im not disabled but dont like walking into the road around badly parked cars. What about children those with pushchairs the disabled and elderly. Hi just been looking at you photo they are in good shape if you have a look around where I live would welcome them that not to say that sometime should not be done to repair them. I have given our council Notice that I will not be using the footpath around my area until they repair them and that means going on main roads in my wheelchair, As it’s to painful to use paths and can not get round all the parked car. I will expect that they wont care and do what they always do. We all know what that is. But we can live in hope (no Hope). How many emails does it take I tried over 100 now and counting. We got to give them something to do .Just keep sending you emails don’t give up and don’t beg them tell them what you want .Let them know your will not going to go away . send emails every day and get your friends to do so. This have not got the money is old hat remember it cost them money to read and file your emails someone has to go through them to see if there is something that they have to act on. Andrea.